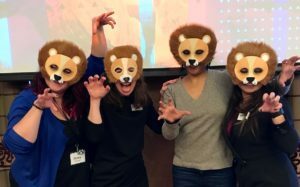 What has hundreds of heads, 91,000 affiliations, and roars like a lion? If you guessed the Research Organization Registry community, you’d be absolutely right! Last month was a big and busy one for the ROR project team: we released a working API and search interface for the registry, we held our first ROR community meeting, and we showcased the initial prototypes at PIDapalooza in Dublin. We’re energized by the positive reception and response we’ve received and we wanted to take a moment to share information with the community. Here are the links to our latest work, a recap of everything that happened in Dublin, some of the next steps for the project, and how the community can continue to be involved. The Research Organization Registry (ROR) is finally here! We’re thrilled to officially announce the launch of our ROR MVR (minimum viable registry). The MVR consists of the following components, which are ready for anyone to use right now. Search: We also built a search interface to look up organizations in the registry: https://ror.org/search. ROR records: ROR IDs are stored with additional metadata about the organization, such as alternate names/abbreviations, external URLs (e.g., an organization’s official website), and other identifiers, such as Wikidata, ISNI, and the Open Funder Registry. This metadata will allow ROR to be interoperable with other identifiers and across different systems. The current schema is based on GRID’s dataset and we plan to incorporate other metadata fields over time and according to community needs. API: The ROR API is now public. You can access the JSON files at https://api.ror.org/organizations. OpenRefine reconciler: We’ve released an OpenRefine reconciler that can map your internal identifiers to ROR identifiers: https://github.com/ror-community/ror-reconciler. Documentation: We have begun storing documentation on Github and will be adding more as we go along. Please feel free to follow and contribute: https://github.com/ror-community. On January 22, 60+ representatives from across the research and publishing community gathered in Dublin to see what the ROR project team has been up to, demo the first prototypes in action, and discuss where we want to go next – and, of course, to practice ROR-ing together. As such, researchers don’t ever have to be responsible for knowing what a ROR is and using it appropriately – the systems they use will do this for them. Culturally sensitive, inclusive, and respectful of what countries are already doing with regard to organizational identifiers, partnering with national bodies working on this and mapping ROR IDs to locally used identifiers. Now that the ROR MVR is here, we’re hearing some really good questions about the data we’re capturing, how it can be used, and how we’ll be maintaining the registry going forward. We wanted to take a moment to respond to some of these questions. What is the criteria for being listed in ROR? What is a “research organization”? We define the notion of “research organization” quite broadly as any organization that conducts, produces, manages, or touches research. This is in line with ROR’s stated scope, which is to address the affiliation use case and be able to identify which organizations are associated with which research outputs. We use “affiliation” to describe any formal relationship between a researcher and an organization associated with researchers, including but not limited to their employer, educator, funder, or scholarly society. Will ROR map organizational hierarchies? No – ROR is focused on being a top-level registry of organizations so we can address the fundamental affiliation use case, and provide a critical source of metadata that can interoperate with other institutional identifiers. ROR IDs are cool – what can I do with them? Now that we have built our MVR, we will be working to incorporate ROR IDs into relevant pieces of the scholarly communication infrastructure. If you are a publisher, funder, metadata provider, research office, or anyone else interested in capturing affiliations, please get in touch with us to discuss how we might coordinate. If you are a developer, you are welcome to start playing around with the API: https://api.ror.org/organizations. There’s an error in my organization’s ROR record — can you fix it? For the time being, please email info@ror.org to request an update to an existing record in ROR or request that a new record be added. We will formalize our data management policies and procedures in the next stage of the project. What is ROR’s relationship to other organizational identifiers? For ROR to be useful, it needs to augment the current offerings in a way that is open, trusted, complementary, and collaborative, and not intentionally competitive. We are committed to providing a service that the community finds helpful and not duplicative, and enables as many connections as possible between organization records across systems. I have my own dataset of institutional affiliations — can I give it to ROR? We are always happy to hear about other efforts to capture affiliation data. Please get in touch with us to discuss how we might coordinate. Can ROR support multiple languages and character sets? GRID already supports multiple languages and character sets, so by extension ROR will have this enabled as well. Here is one example: https://ror.org/01k4yrm29. How will ROR handle curation, i.e., updating records if an organization changes its name or ceases to exist? The curation and long-term management of records will be a cornerstone of our efforts in 2019 and we hope to release a working set of policies and procedures soon. Now that we have our MVR, what happens next for ROR? We’re eager to sustain the momentum from January’s stakeholder meeting at the same time we know there are some longer-term plans to put in place, and so we’re looking at both some immediate tasks as well as bigger-picture questions. We have a few to-do items on our list following the launch of the MVR to keep everything running smoothly while we develop a comprehensive long-term product roadmap. We’ve been emphasizing here and in community conversations that our primary focus now turns to formulating policies and procedures to ensure the successful management of ROR data over the long term. This is something we can’t (and shouldn’t) do on our own — we want to work with community stakeholders to develop the right solutions and establish the right frameworks. We understand the urgency of firming up these policies, but we are also aware that something this important can take time to complete and is not something to rush into lightly. To help guide the next stages of the project, we are putting out an open call for participation in the ROR community advisory group. Advisory group members will be involved in giving input on data management, testing out new features, giving feedback on the product roadmap, and discussing ideas for events and outreach. We plan to convene this advisory group through bimonthly calls and asynchronous communication channels through the end of the year. We hope you will consider joining us! Please email info@ror.org if you are interested. For those who want to stay informed about the project but not necessarily be part of the advisory group, you have other options! Follow us on Twitter (@ResearchOrgs). You can also always drop us a line at info@ror.org, and let us know if you’d ever like to set up a meeting or conference call to talk about the project in more detail. Community engagement has been vital to ROR’s beginnings and will likewise be critically important for the next steps that we take. As both a registry of identifiers and a community of stakeholders involved in building open scholarly infrastructure, ROR depends on guidance and involvement at multiple levels. Thank you for being part of the journey thus far, and for joining us on the road that lies ahead. This is a syndicated post. Read the original at UC3 :: California Digital Library 2019-02-12.